Are you a fan of the Toyota RAV4? What if we told you that you could now purchase this same vehicle but with better fuel efficiency? You would have to be crazy to turn an offer like this down! For its 2016 models, Toyota will be introducing the RAV4 Hybrid, which will offer almost all of the same amenities at the traditional RAV4, but provide better gas mileage do its hybrid nature. If this is something that sounds interesting and appealing to you, then head over to Toyota of Poway where our sales team would be happy to tell you all about the RAV4 hybrid! The all Toyota RAV4 is not only rolling out some new improvements and features but it is also rolling out the 2016 RAV4 hybrid model. With so many other vehicles rolling out their own hybrid versions of their most popular vehicles, it is no surprise that a RAV4 hybrid will now be available. This smaller SUV features a 2.5L 4-cylinder hybrid engine that is sure to save you money on gas. Stay tuned for the exact mpg you can expect from this vehicle. When it comes to the 2016 RAV4 Hybrid’s features, you can expect similar ones that you will find on the traditional Toyota RAV4. This means that not only will you enjoy some great mileage that will save you some money on gas compared to other vehicles, but you will get all the best parts of the other RAV4 models. Some features that you can expect for the 2016 RAV4 Hybrid include an extra USB connection, a 7 inch touchscreen, LED headlights, leather-wrapped steering wheel, air conditioning, AM/FM radio, and plenty more! If you’re a driver in Escondido, San Diego, or Carlsbad in search of the next great fuel efficient vehicle, then you won’t want to miss out on the 2016 Toyota RAV4 Hybrid. Be one of the first drivers out there to get your hands on this brand new model release. 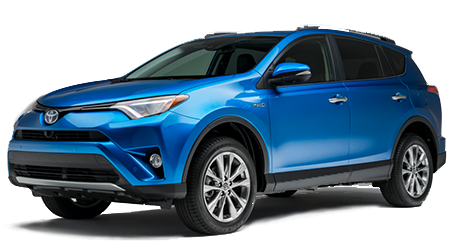 Visit us at Toyota of Poway for all the information you need on the RAV4 Hybrid. We will work hard to help you drive home in one of these great vehicles today!